Elbow Valley residents are actively engaged in their community and keeping them informed is our top-priority. 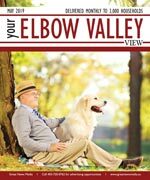 Your Elbow Valley View is the official community newsletter, and covers community news and is published monthly to keep content current and relevant. Delivered to every household, apartment, and business, every resident is acquainted with the community’s most important information. The Community Land, just west of Elbow Valley Lake, is the location of the Residents Club and recreational facilities. The Residents Club includes social gathering areas, washrooms, kitchens, as well as office space and storage. In addition, there is a beach area and boat house stocked with canoes and paddle boats, as well as tennis courts, a sports court, play structures, a picnic area and parking for resident use. The exact use of this area was determined by Elbow Valley residents themselves. Through the Communities Forever Program under which funds from each lot purchase were allocated specifically for recreational developments in this area. Today, Elbow Valley Estates' demographic includes all lifestyles and ages – executives, families and empty-nesters refer to this community as their home. It has beautiful bungalows, spacious luxury homes and expansive lots, with views of rolling hills, wildlife-filled woodlands and mountains. Homes have been built to complement the landscape, and nestled upon expansive lots with plenty of native plants, shrubbery and trees. To preserve its natural splendour, development of the community roads, pathways, building, and waterways is controlled to maintain the area and landscape for future residents. Widely known as a unique, one-of-a-kind residential place, Elbow Valley Estates was honoured as Community of the Year in Canada for the years 2002 and 2003; and Calgary Community of the Year for 1999 and 2000. For more detailed info visit the City of Calgary community profiles site.